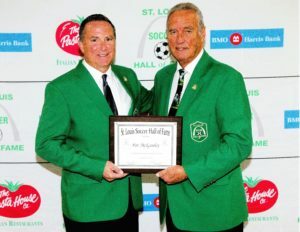 A stellar youth player in his early years for the Imo’s Soccer Club that won a National Junior title, Pat was one of the young men from St. Louis that were heavily recruited by Jerry Yeagley to attend Indiana University. Pat’s acceptance to attend IU was the boost that was needed to begin the dynasty that Indiana that continues to this day. At Indiana, Pat was a member of two NCAA National Championship teams and was individually highlighted by being named MVP at the Sports Festival Final and in 1983 was named MVP at the NCAA Championship by tallying the winning goal in the match. Pat is listed 8th in all time goals and assists at Indiana University. Immediately following IU, Pat joined the Chicago Sting in the NASL where he was named the teams Rookie of the Year in 1984 and the team took the NASL Championship also in 1984. Pat also played for the Sting indoor from 1985-1987.